at Bet365 and powered by WMS Gaming. There are 2 sets of reels, both have 5 rows and the Main Reel Set has 4 lines down and the Colossal Reel Set has 12 lines down. There are 100 paylines and betting starts with a minimum bet of ?0.50, so players get 2 lines for the cost of 1! Wins pay from left to right. The Wild symbol substitutes for all symbols except the feature symbol. 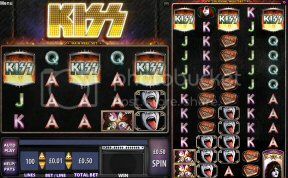 Three or more of the Kiss Symbol will trigger the free spins, and fans will love this, the screen bursts into a video clip of a Kiss concert, then the free spins will start, three Kiss Symbols will award 8 free spins, four will award 12 free spins, five will award 20 free spins and six will award 20 free spins. 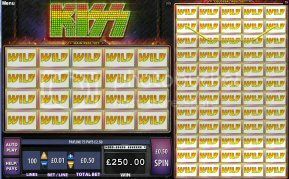 During the Free Spins Feature any wild that appears will first burst into flame and then expand to cover the entire reel, making for some huge wins. The feature ends there is another video clip of Kiss on stage. 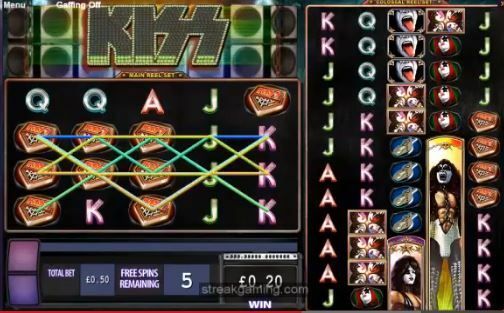 Play it now at Bet 365!